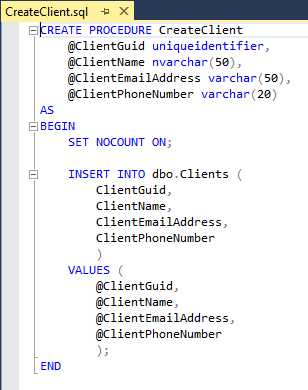 I have created a database project ClientsDatabase and a SQL Server unit test project ClientsDBTestProject to test my stored procedure. The autogenerated test (slightly formatted for readability) is shown below. add second test condition with type Row Count. Set the property Row Count to 1 and change ResultSet to 2. Now we are ready to start our unit test. 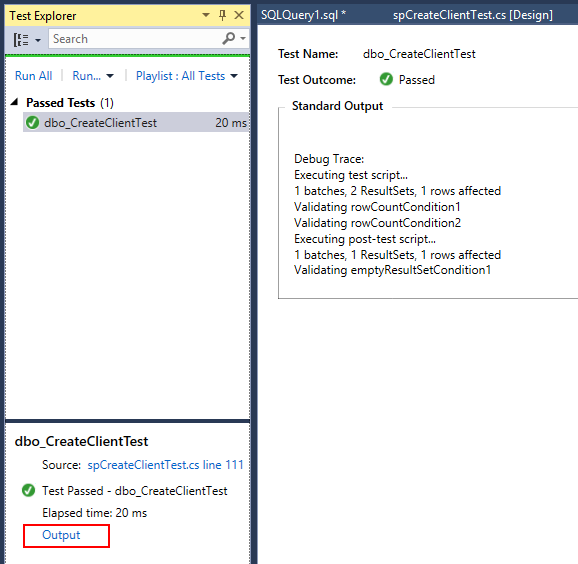 Right-click dbo_CreateClientTest, then Run Selected Tests or simply click Run All because we have only one unit test. If test has completed successfully, we see a green mark near the test name. 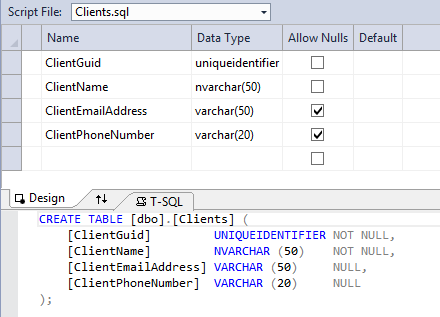 Check the data in Clients table (thanks to SSDT, it can be made from Visual Studio now, or you can use SQL Server Management Studio). And now we see our test record. Is it funny? I think NO. This means that test data is not deleted after the test has been executed therefore the next time we run our test it would fail. Don’t forget about it! It’s not a tragedy because SSDT has capabilities to solve this issue. I’ll write a post about it later. 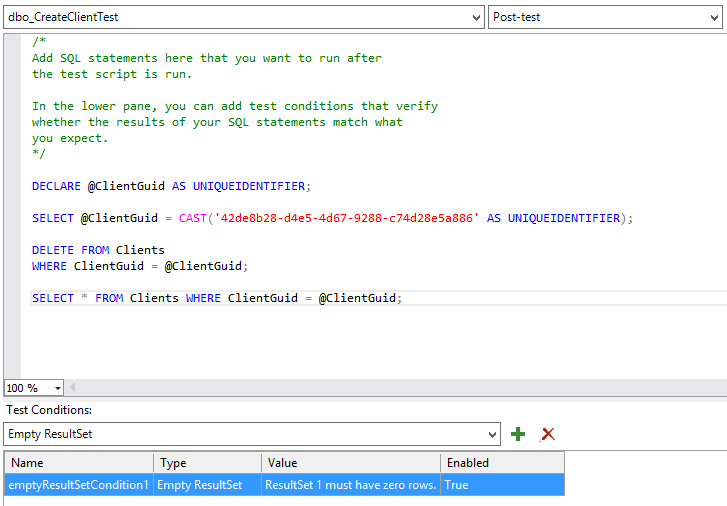 Another interesting feature of SQL Server Data Tools (SSDT) is a unit testing. 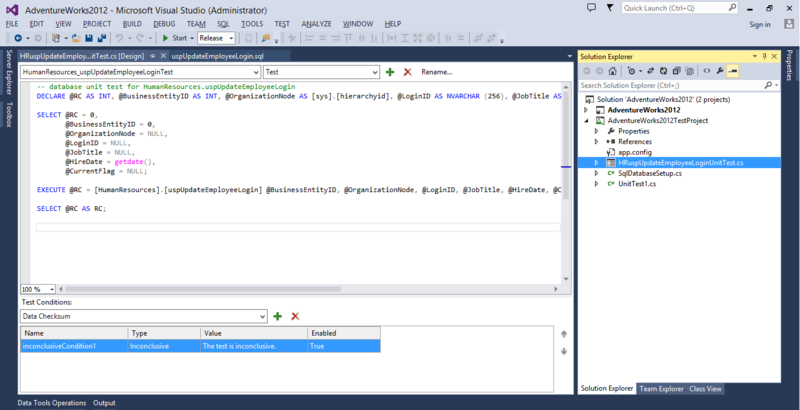 SSDT enables to develop and execute unit tests interactively in Visual Studio. You can write tests for stored procedures, functions and triggers. 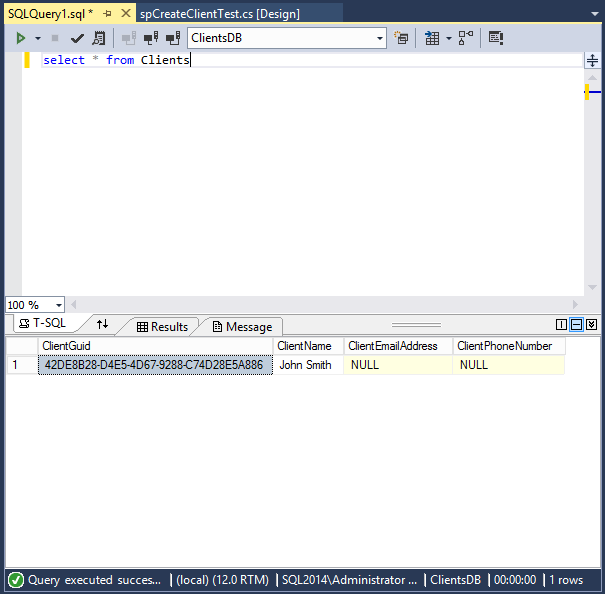 To create a simple database unit test project you need Visual Studio + SSDT, of course, and a database project (how to create it I wrote in this post). 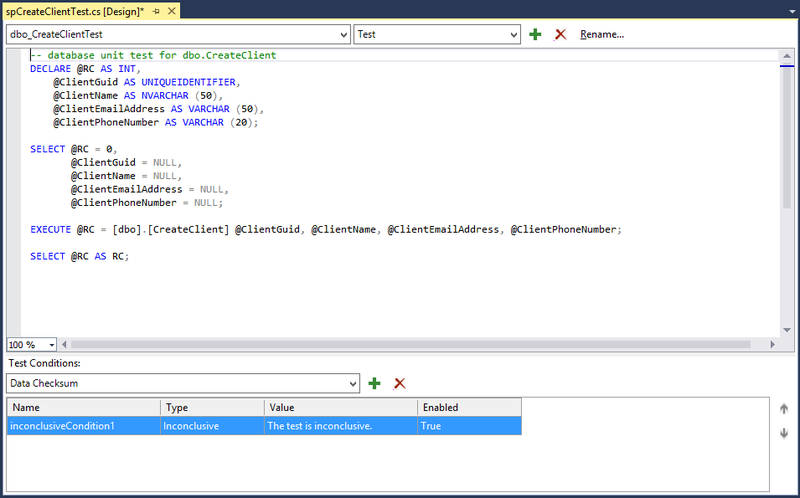 In Create Unit Tests window check that only one database object is selected (on which you right-clicked earlier). Choose the type of test project (Visual Basic or C#). This does not influence the database tests, it’s just a language of test project. As you see later all the work around the test will be made in the graphical interface of test designer. Type the name of your test project and the name of a test class. In SQL Server Test Configuration choose an existing connection (I’ve created it earlier during the creation of database project) or create a new connection, then press OK. 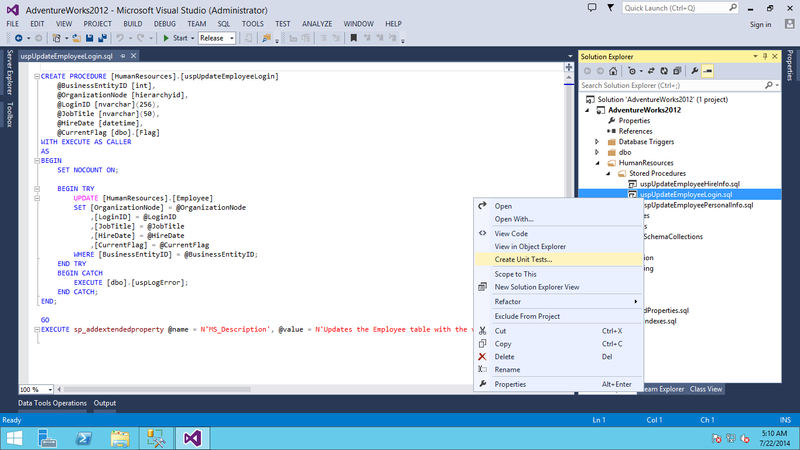 Visual Studio will create a database test project and unit test. 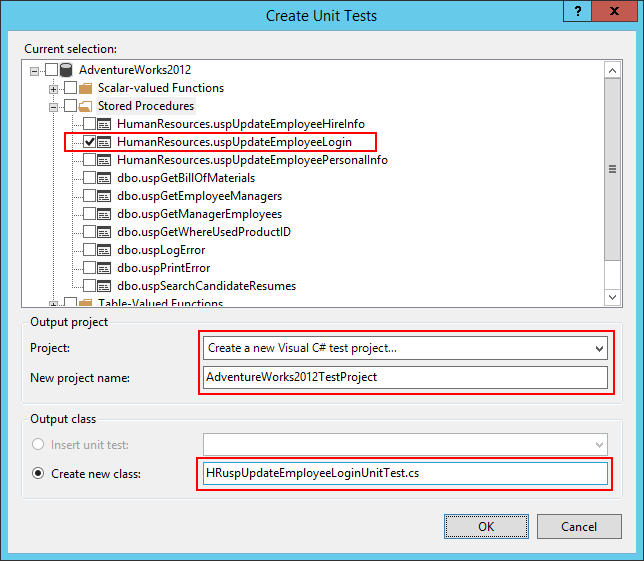 This unit test will be opened automatically in Test Designer.